What's the largest Battle you've been in? How many planes were in the battle and how many did you control? Last but not least, Which era WW1 or WW2? Show photos if you've got them . .Obviously we used cards but not the controls panels.The dogfight was solved in one afternoon. This happened only one time-it takes a LONG time only to prepare the game,so.. Nothing extravagant I'm afraid. Usually two a side plus replacements for balloon defence, late arrivals etc. The most I have flown myself is three. The most planes flown at one time is about eight, but this is a rare event. We have been playing WWI only so far. Our largest battle has been 4 aircraft. But as we play some of the scenarios, we will have more in play. For WWII most I has was four players with two planes each. Four a side is the largest for me, more than that is a bit too crowded for my liking (using the WoW mats). Normally I'll only control two, or less often four, but I've "flown" eight on rare occasions when I've been working on scenarios or house rules. My vote of 10+ might be misleading. Since it wasn't stated WoW my 10+ was for Canvas Eagle games. Just 4 planes, 2 players. A week ago, we had 6 planes with 5 players. It was chaos! I hope we can get a big amount in the air simultaneously in the near future. I played this summer in a PBeM (play by E-mail) game that had 42 aircraft minis on a board about 5 feet square. 1 aircraft per player. It was an excellent game. 2 Turns per week. For our regular, in-person scenario games (e.g. a photo recon mission with escorts encountering an enemy fighting patrol) we usually have 7-8 aircraft on the board (one aircraft per player). It is tempting to try to fly 2 or more aircraft per person to get even more aircraft on our 5' X 5' board, but we find that it is difficult to manage more than 1 aircraft without feeling stressed/rushed especially when game play is quite fast. Our games are for pleasure; being stressed/rushed is not a pleasure for most of us. If I recall correctly the most I've flown at one time was five v five - not terribly practical and it took about four hours or so to play. Usually play two at one time now & very occasionally three. The most I had was 4 ( bombers) but 14 on the mat ,nine players .It was last friday on a battle of britain mission . I made a post in the campaign world war two section. Not all fights were even up. Four is the most for me. I have a large family so we can at least 4 player at any one time, plus a couple of friends and we have 6-8 player at one go. We play both WW1 & WW2, but stick to one plane each as it gets to confusing with more! Well if it fits into a slot then its OK. I guess I just like round numbers . I played in 8 planes scenario with bombers (max 5 players), both WWII and WWI. Hunter and I frequently fly three each, although we once tried 4 each, which resulted in a total chaotic mess of overlapping planes (minis). On top of that, we had trouble keeping track of special damage and altitude so we ended up stopping the mission half way through. With 2 players, 3 planes per side seems to work well. Will try to move up to 4 planes, but expect to start getting into confusion. Our playing area seems best for not more than 3 planes per side (with maybe a balloon and some ground AA). Other planes could appear as reinforcements/replacements. Eight planes is the largest fight I have been in... and that was four on four. I am reallly hoping to try out a larger free-for-all furball sometime... I am sure it will be a bit slow at first... but should be interesting! Joe that's how we do it. Everyone helps with the moving of the planes. We usually have 8 to 10 players with one plane each. I have to say I don't like free for all's. Its always nice to know somebody has your back and you have theirs. Especially if you both fly well together. Each knowing how the other flies and fights. Yes, we kinda just get in there and scrap. We have'nt really played with someone watching your back. But we sure will soon. Right now wev'e just been playing on a kitchen table sort of. Our next BIG project is to play on our 4'x8' terrained gaming table. I only play ww1, and 6 was the most with 5 players. My friends and I play that if you get shot down you pick a different model and come back in as a late comer. It was the first game I play of WOW, and I choose a Fokker Dr1 and I managed to shoot down five before I was hit 3 times, and I had two gun jams. I guess that was beginners luck. It was the first game I play of WOW, and I choose a Fokker Dr1 and I managed to shoot down five before I was hit 3 times, and I had two gun jams. I guess that was beginners luck. You shot down FIVE planes in your first game?!! Amazing!! I must admit it was either beginners luck or you're destined to be one of the best WOW pilots in history!! Seriously, though, there are those times in a big furball where everything goes right and the planes just keep flying into your gun sights. I have to talk my board game group into flying (it's a lot easier now that we've played a number of games). We do a thing called birthday bash where on your birthday you get to choose a game to be played. I chose Wings of War and got 8 people to go four against four with one airplane apiece. Everybody has a great time, even those downed quite early--I think. WW1, usually 4 Players & so far max 6 Aircraft. Battle with 12 planes, 2 each player. That bomber is flying perilously close to the edge there Stuart! Then again, it's plain to see the level of harassment it faces from the sides and the rear. 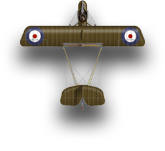 As for games, I only play with the WWI setting, usually flying for the Central Powers [I do confess to being in love with colorful planes]. The largest game(s) I have participated in have all involved 6 planes (3 on 3). I once flew a game with my wife, each of us piloting three planes each. It was fun, but the game seemed to drag on forever — mostly because of us trying to keep everything sorted out in our heads regarding strategy, damage, stats, etc. We flew another game with friends where it was two people versus three people. In this case, each person flew their own plane, while I piloted two of them so as to balance out the field. It was a blast! Call me nuts--yeah, yeah, we all know I really am anyway LOL--but someday I'd like to do one of the smaller carrier-battles like Coral Sea or Zuiho's Aleutian operations plane-for-plane (and with ship support/targets). 14 with 12 players, will try to get some pictures posted. We always play one plane apiece, never more. Then you feel like flying a particular plane, not like playing a game. There are 2 - 6 players/planes in the air in each of our battles. Last edited by Nightbomber; 06-28-2011 at 07:26. Usually 2 to 4 players, 1 to 2 planes each depending on skill level (new players fly 1 until comfortable). I usually fly 2 planes occasionally 3. With 2 it feels like you & a wingman are somewhat co-ordinated. Plus it keeps me in the game after my 1st pilot goes down in a blaze of glory! one plane apiece, never more. Then you feel like flying a particular plane, not like playing a game. .
We usually have three to five players, each flying one plane. A couple of times we've allowed a player to fly up to three planes, if the mission warranted more planes, but the player doing this usually gets the maneuver cards mixed up and confused, e.g., using 'A' deck for DH4 or vice versa. Most planes I've played at one, in a game, was two. I prefer just one. The most players in a game I've played with was last Saturday with 9 each playing one plane. In April was in a game with 8 players and 8 planes. 2-player 3-on-3, spitfires vs Bf-109s. It got a little confusing, but it worked out in the end. At a convention at Lancaster PA I was playing a game with my friend at 8 pm. As guys were walking by they wanted to play because we were having so much fun. Ended up with 14 players and the game being called at midnight. If you got shot down you got your plane back the next turn. It was a blast. Met alot of great guys and learned some rule modifications that I really liked. Luv this game! Biggest Game was a 3 vs. 3, WW I, Central powers vs. Entente with 6 players, each one commanding one plane. At Floor Wars in Willoughby there were in excess of 10 planes counting the seven British Bombers on a single base. last week ,played my largest game so far 26 planes I controlled 2 a pair of snipes . one exploded on turn two the other stayed until the final turn before being blown from under me . WW1 of course.